Sunday evening saw yet another interesting gathering at Piano Park @ URA Centre. 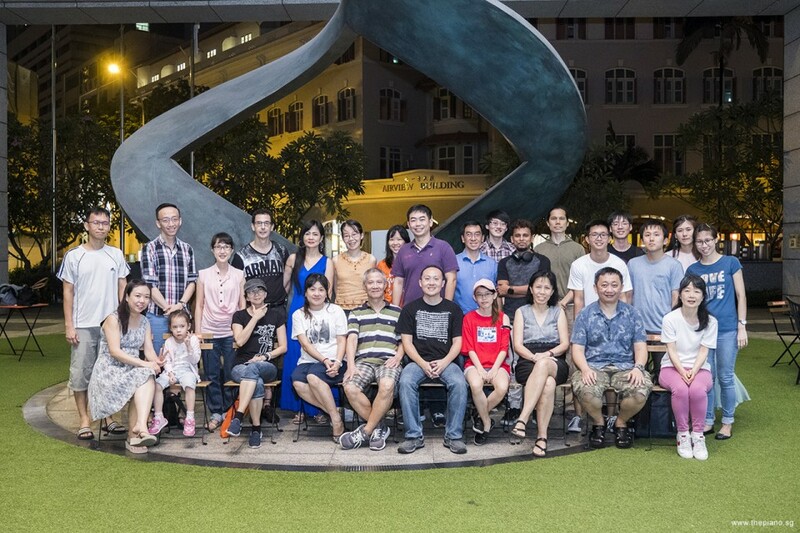 It was Pianovers Meetup #78, part of the weekly meetup of passionate piano music lovers. 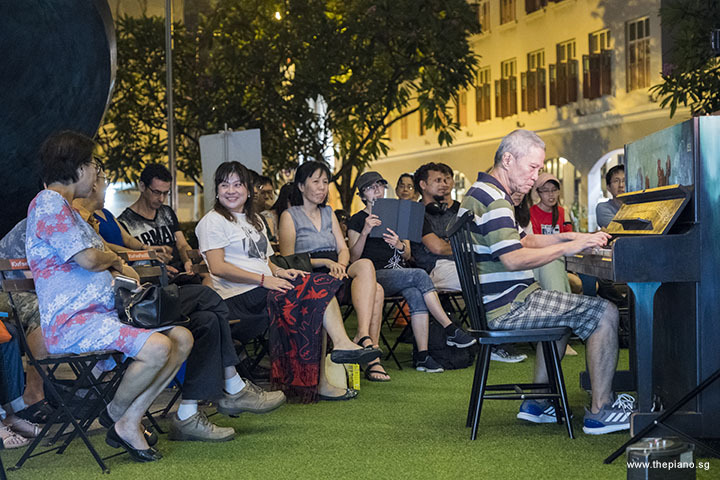 Ever since the event started in July 2016, it has been building a community of piano lovers, which numbers about 8,500 currently. 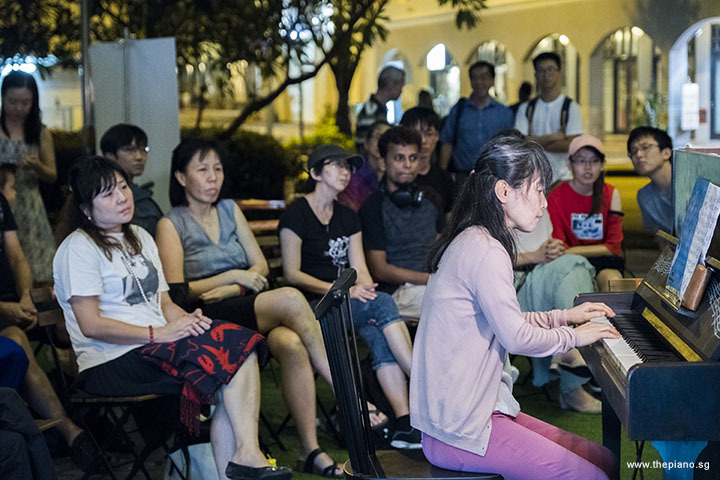 Organised by ThePiano.SG, Pianovers Meetup is a platform for aspiring pianists and ordinary people to meet, network and play the piano. Every Sunday, a group of Pianovers meets early, a full hour before the programme starts, to have dinner and bond informally. This evening, we had Yu Wei, Xue Pin, Hiro, Markov and Gavin joining Sng Yong Meng, the Founder of ThePiano.SG for dinner at Maxwell Road Food Centre. Over delicious local grub, the group chatted and shared their piano playing and learning journey and had a great time. 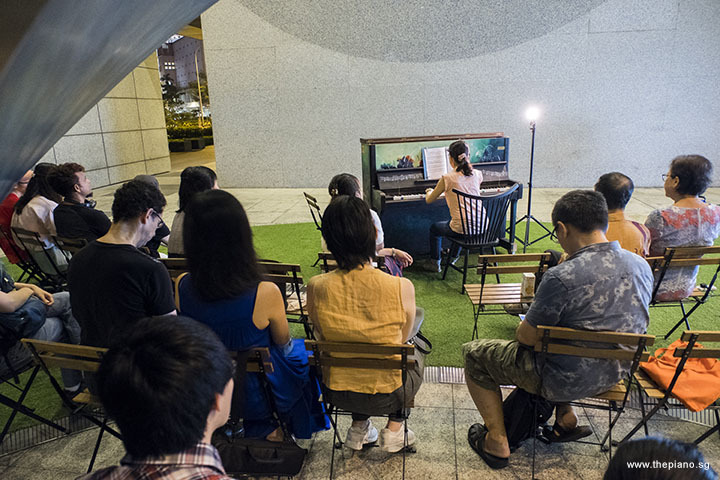 Soon, it was time to return to Piano Park, where they were greeted by waiting members. As the group waited for the meeting proper to start, Yong Meng spent some time setting up the equipment. Thereafter, he made some important announcements. 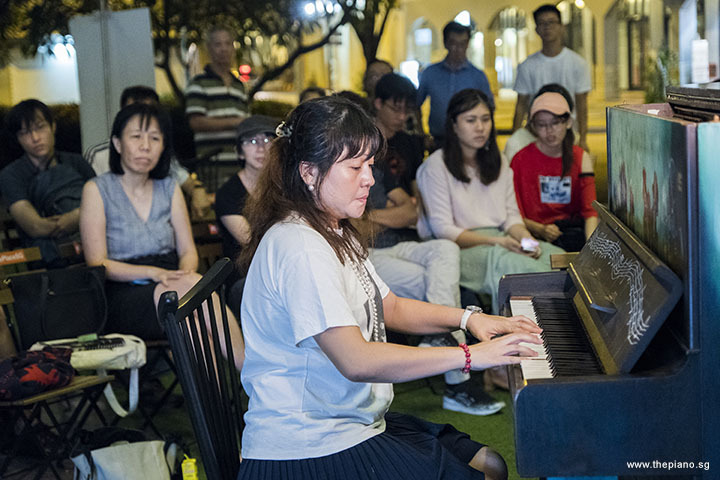 First on the list was Pianovers Sailaway, an event that will see a group of 40 piano lovers head out to the open sea on a 68-foot-long luxury yacht equipped with four pianos. The first event happened in December 2016 and it was a resounding success. 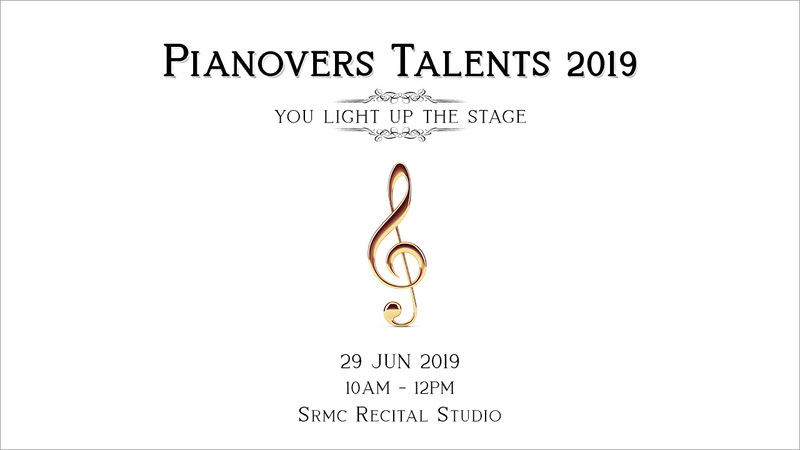 On 9 June 2018, Pianovers Sailway #2 will take place and this time, we are extremely excited to have well-known personalities with us! 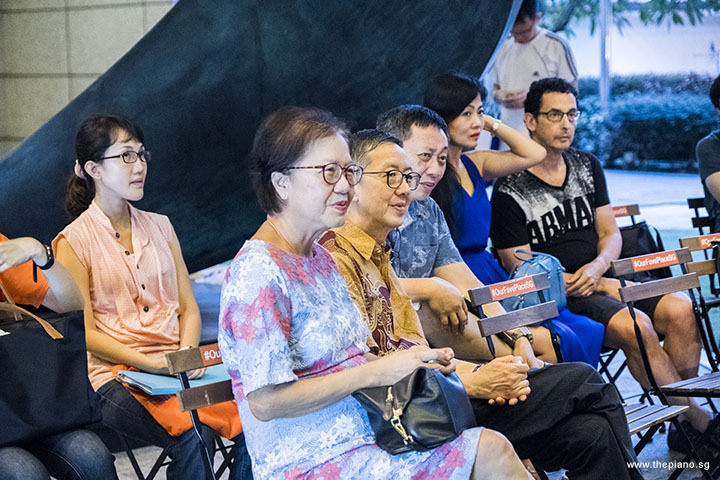 This year’s event will see Aaron, Chi Sheng, Sia Yuen and their fans on board the yacht! 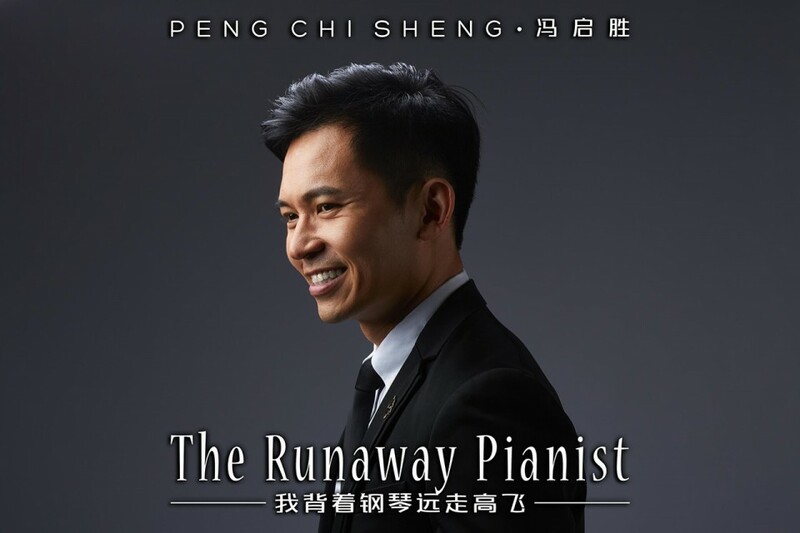 Chi Sheng, a pianist, sold his first published song “This Time It Is Real 这次是真的 ” to famous Hong Kong actor Tony Leung 梁朝伟. 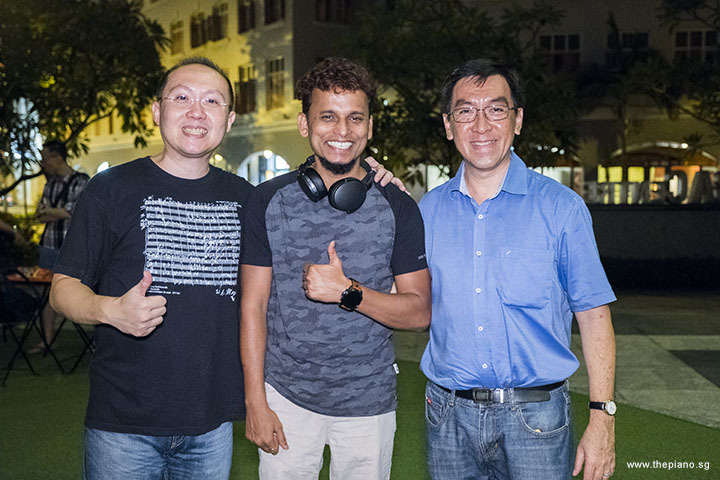 Aaron, on the other hand, is the first and only Certified Master Teacher in Estill Voice Training in Singapore, certified by Estill Voice International in 2016. As for Sia Yuen, she became the first Singaporean singer to take part in Zhejiang TV’s (浙江卫视) Sound Of My Dreams (梦想的声音). During that programme, she challenged JJ Lin 林俊杰 on the set with her amazing vocal quality and ability to sing cross-genre songs, mesmerising over 1.2 million viewers in the process! 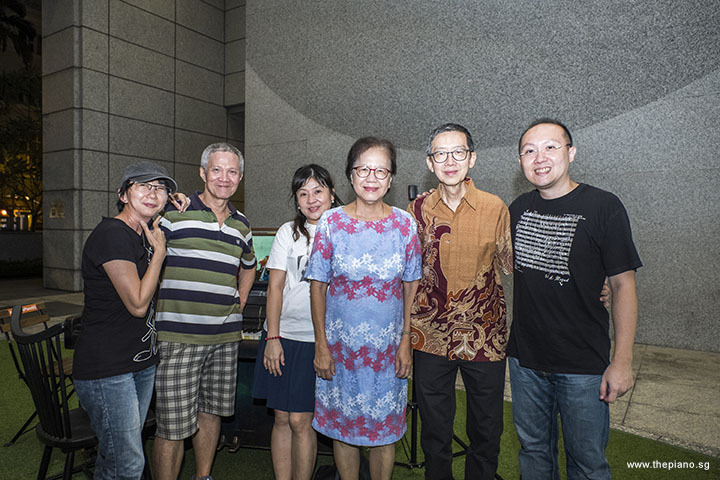 This evening, ThePiano.SG is honoured to have Dr Quek and his wife, from Khoo Teck Puat Hospital, grace our event. 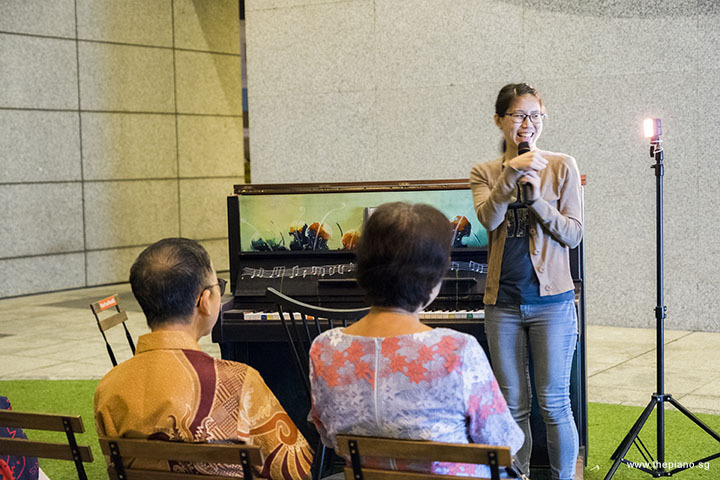 Three of our Pianovers, Albert, Siew Tin, and Jia Hui, had recently visited Khoo Teck Puat Hospital to play the piano for the patients, care-givers, and passers-by. 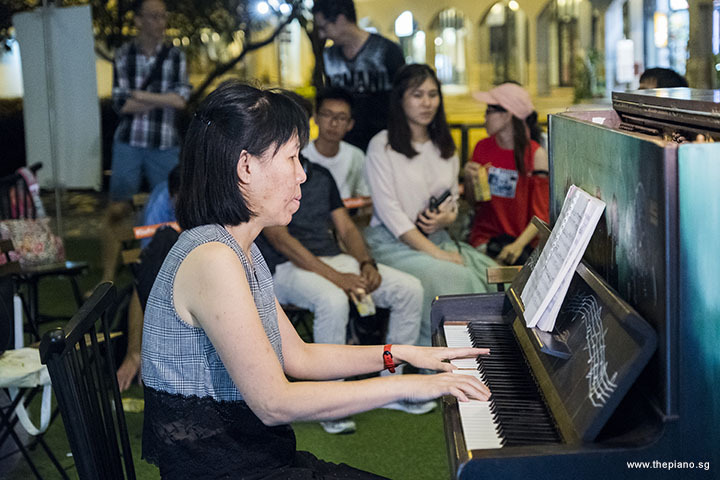 They had told Mrs Quek about our Pianovers Meetup, and she was keen to join us! 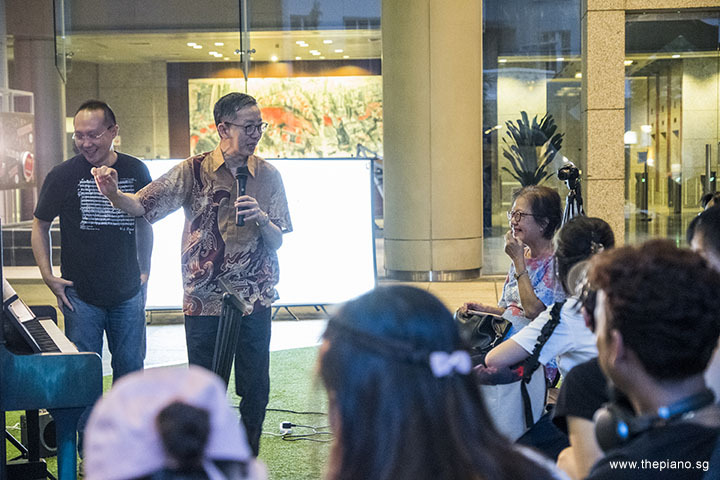 We shared with them that our Pianovers Meetup platform is made accessible to every person in Singapore. 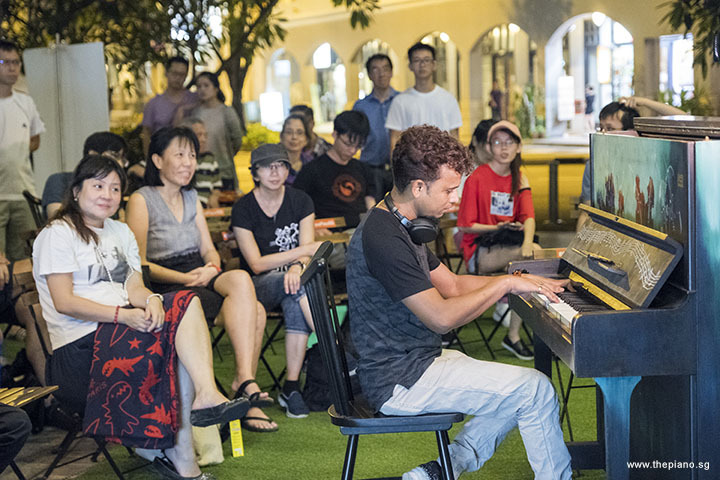 No person, because of his financial background, should be denied a chance to discover his potential, and we will continue to keep Pianovers Meetup a free event for everyone in Singapore. 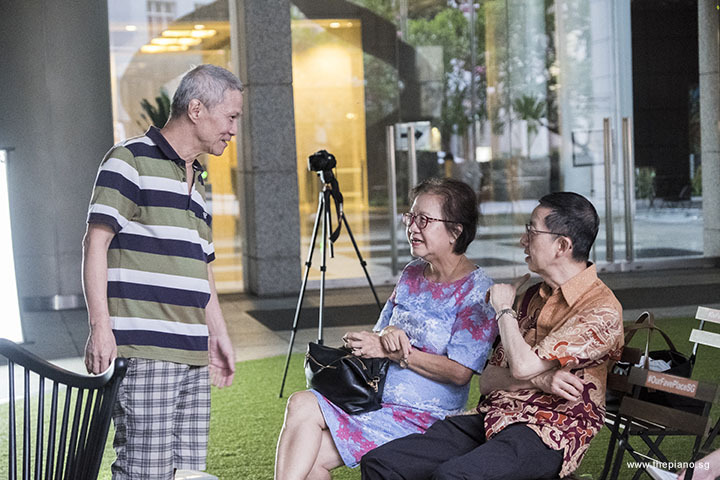 Thank you Dr Quek, and Mrs Quek for your support! Soon, it was 7pm and the lights at the URA Centre were turned on. 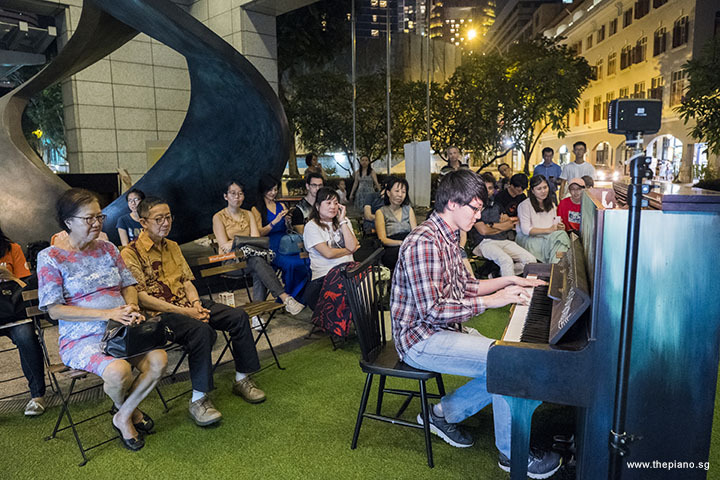 This was the highly-anticipated moment for Pianovers, as it signaled the start of the Mini-Recital. 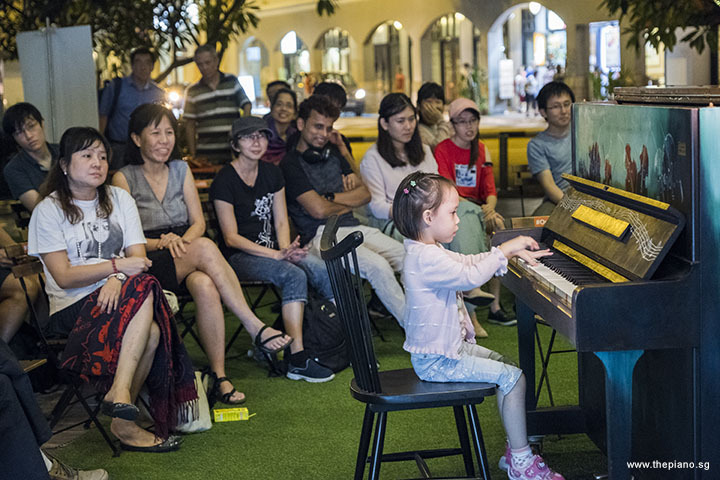 The Mini-Recital is the segment of the evening where pre-registered pianists get a chance to take to the stage and play to an appreciative crowd. Gavin was the first to play on the piano tonight. He played Hungarian Rhapsody No. 3 in B flat Major, S244/3 by Liszt. This was part of a set of nineteen Hungarian Rhapsodies composed by Franz Liszt for solo piano. Among the set, the most well-known is Rhapsody No. 2. It was used in Tom and Jerry cartoon episode known as "The Cat Concerto". Following Gavin was David, who delighted the audience with Impromptu in C minor, Op. 90 No. 1 by Franz Schubert. Written in 1827 for the solo piano, The Impromptus were published in two sets of four impromptus each. The first set was published as Op. 90 while Schubert was still alive. The second, however was published posthumously as Op. 142 in 1839. Siew Tin played two pieces this evening, I Am Sailing by Gavin Sutherland, as well as Feelings by Loulou Gasté. "Feelings" is a 1973 song, written by Morris Albert but set to the tune of "Pour Toi" (For you). "Pour Toi" was separately composed by Louis “Loulou” Gasté in 1957. In 1977, it came to Loulou’s attention that the song was based on his original 1957 melody and he sued Albert. The court ruled in favor of Loulou Gasté. Today, he is officially recognised as the sole creator of the song. For his effort in composing the melody, he gets seven-eighths of all royalties, with Albert receiving the rest. Our regular Pianover, Albert, played a Chinese classic, "浪子心声" by 许冠杰. 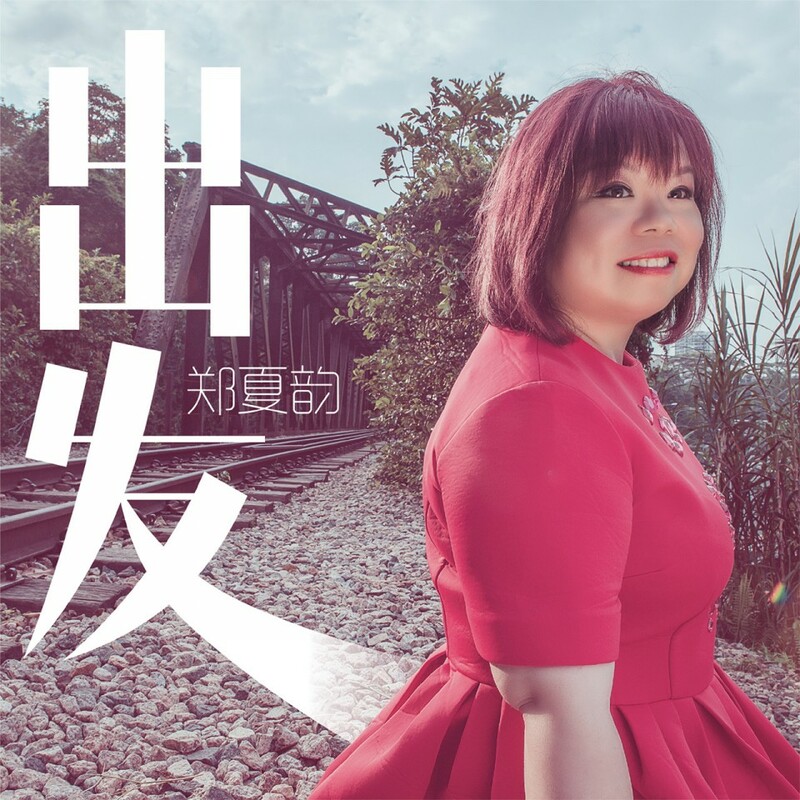 许冠杰 is a Hong Kong music personality and is well-known as 阿 Sam. He is recognised for popularising Cantopop and is even considered by some to be the first major superstar of that genre. For this reason, he is known as the God of Songs. 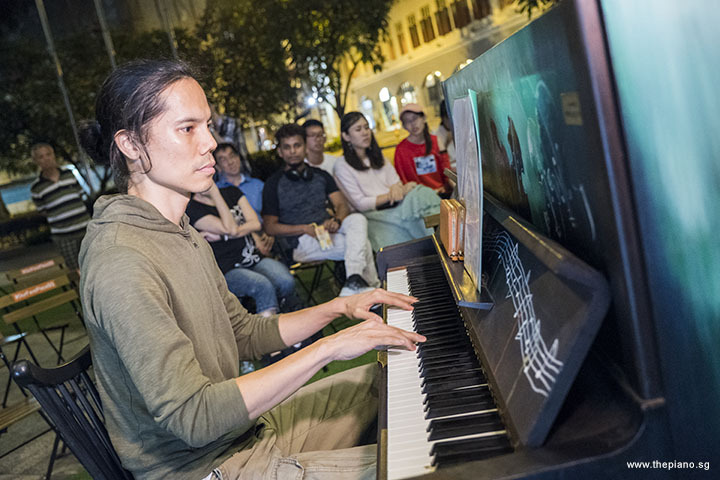 He is also known to be the pioneer of the practice of being both the composer and performer in the Hong Kong music scene. 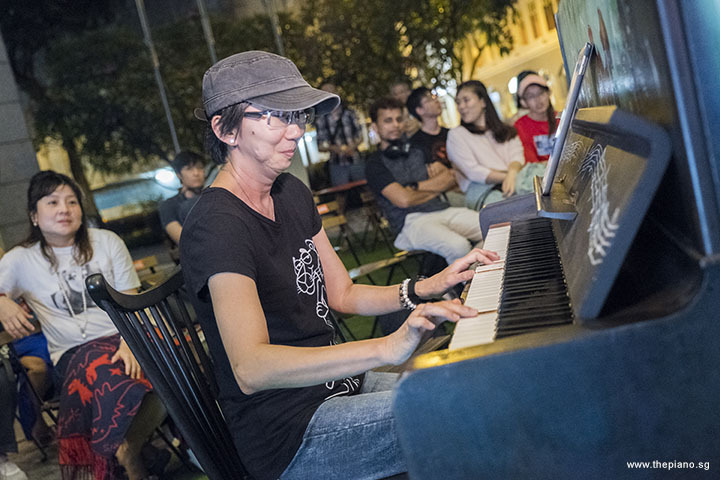 Next to come up to the piano was Teik Lee, who performed 梦一场 by 袁惟仁. This song was compiled in 1999 and released as part of the album known as "干脆", performed by 那英. 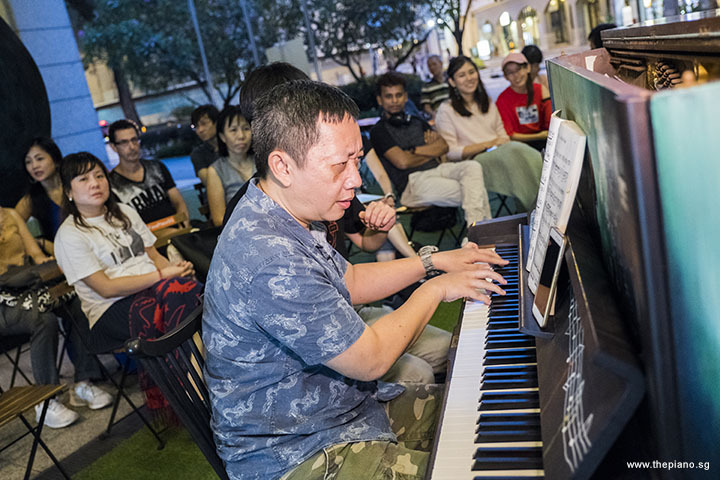 It is also known as the sister song of the other piece known as "梦醒了". Together, these two compositions are known as the “Twin Dreams” composition by 那英. Janice Liew performed Pres du Coeur by Jean Baudlot and Paul de Senneville. This piece came from the 1984 album "Coeur Fragile (Fragile Heart)" by Richard Clayderman. Clayderman is considered by the Guinness Book of World Records as "the most successful pianist in the world”. Young pianist I-Wen played Honey Bee March, as well as Ladders and Stairs. During the last Meetup, I-Wen played without her mum, Jenny, holding her hands, although she was still beside I-Wen. This evening, I-Wen played independently! I-Wen's parents were standing at a distance away, and I-Wen was by herself! We are very happy that I-Wen has reached yet another milestone in her piano learning journey. We are also elated that we, Pianovers, have all walked this journey together with her and witnessed her reaching the milestone. Pauline performed "Etude in A flat Major, Op. 78 No. 3 (“Melody”)" by Maurice Moszkowski. Moszkowski was a well-respected composer in the late nineteenth century. Today he is known for his fifteen Études de Virtuosité, Op. 72. Many of his small but brilliant piano pieces, such as Étincelles (Sparks), grace the end of classical concerts as encore performances. Moszkowski’s life ended in a sad way. In December 1924, he was ill and heavily in debt. His supporters arranged a concert on his behalf at Carnegie Hall in New York City. 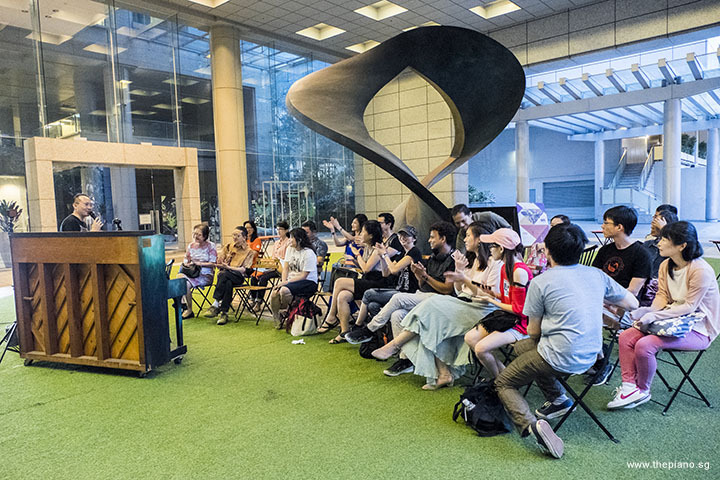 This event saw 15 grand pianos on stage and netted USD13,275 (the equivalent of USD187,793 in May 2017). Unfortunately, Moszkowski died from stomach cancer four months later, before the funds could reach him. The money was used to pay his funeral expenses, as well as support his family. Masumi played Sonata No. 28 in A major, Op. 101, 4th Movt by Beethoven. In previous Meetups, Masumi played different parts of this composition. She played the first and second movements during one Meetup. 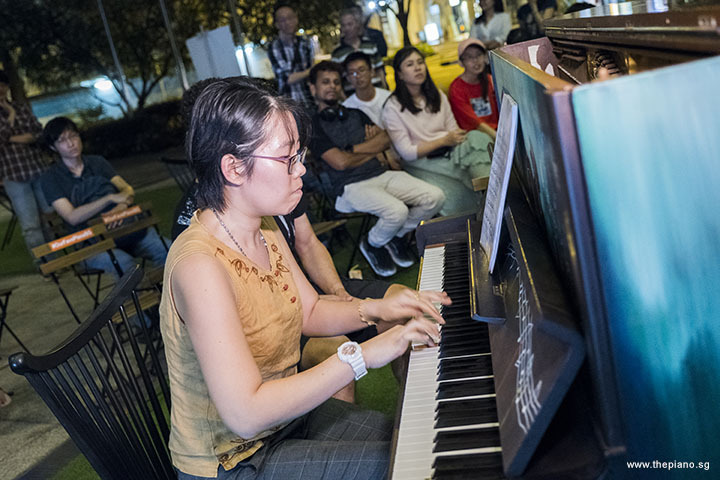 In the following Meetup, she played the 3rd movement and half of the 4th movement. Today, Masumi completed this Sonata! The 4th movement is the longest and the most technically challenging movement in this sonata. This movement is special in that Beethoven explored the newest keyboard set and used the lowest E (E1) on the piano near the end. 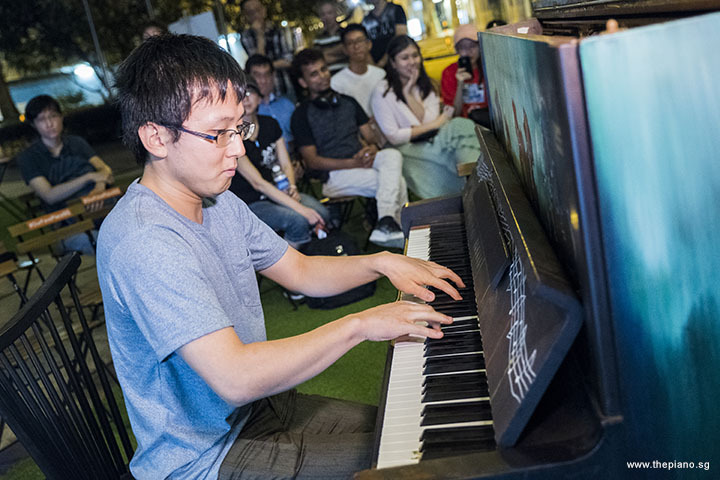 Jia Hui played 贝加尔湖畔 by 李健. 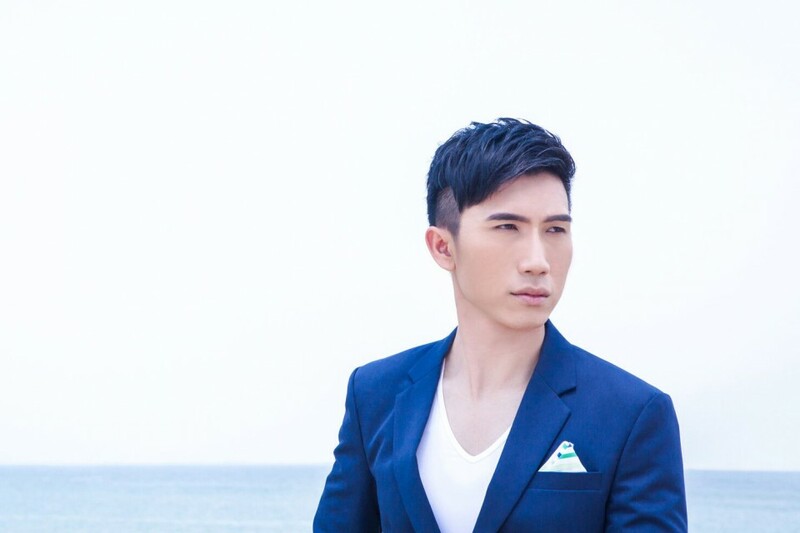 This song was compiled in his 2011 album and won the competition, 中国好声音年度金曲奖, in 2014. This song was inspired by Lake Baikal (which translates to Nature Lake) in Russia. This lake is the world's deepest lake and is also considered to be one of the world’s clearest lakes. At 25-30 million years old, Lake Baikal is also considered to be the world's oldest lake. In 2011, Russia’s Ambassador to China and 李健 were touring the lake. 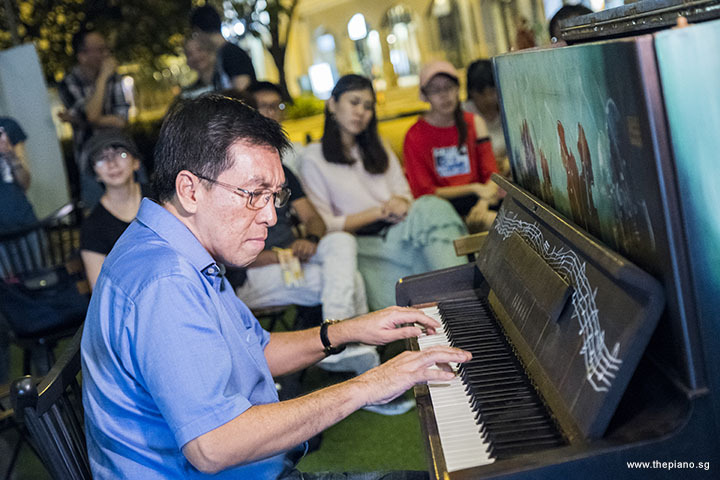 Upon the Ambassador’s invitation, 李健 decided to write a song about the pristine lake. Next to play at the piano was Matthew Soh. He performed 千本桜 (Senbonzakura) by 黒うさ P (Kurousa-P). Although this song has an upbeat track, it contains dark themes and references guillotines and intercontinental ballistic missiles. The lyrics also describe lines such as "Songs of lament go unheard" (嘆ク唄モ聞コエナイヨ) and "This is a banquet inside a steel jail cell" ( 此処は宴 鋼の檻 ). Paul Nirmalendu performed Perfect by Ed Sheeran. One year ago, Paul started to join the Pianovers Meetup, and did not know how to play the piano then. However, he was inspired by the members here and started learning how to play the instrument. 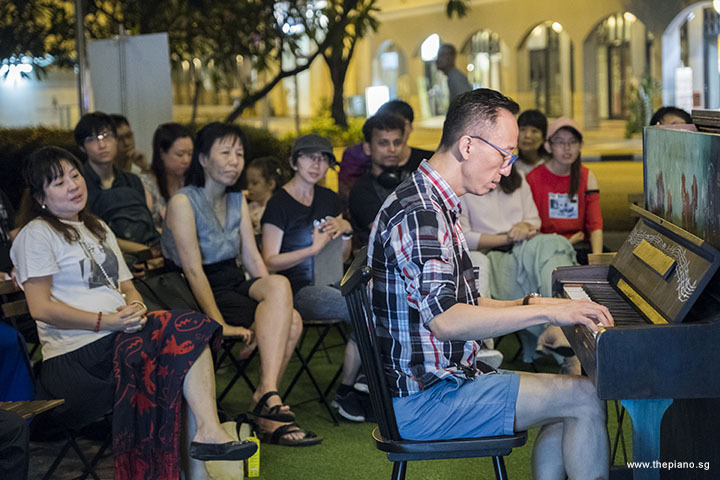 Having learned piano with zero background but now playing in front of all of us, Paul epitomises the meaning of the word “Perfect” - he is the “Perfect” example of an inspirational story to be shared with many other Pianovers! We are all very happy for Paul and we are sure his passion will bring him much further! May you have a most fruitful journey in the world of piano! Mark Wong played Intermezzo in A, Op.118, No. 2 by Johannes Brahms. This piece is featured in the compilation "Six Pieces for Piano, Op. 118". This compilation is very much beloved in the classical music circles and was dedicated to Clara Schumann. It was the second last composition to be published while Brahm was still alive. Interestingly, Clara was the first to perform any of Brahm’s works publicly. May Ling performed Hornpipe (from The Water Music) by Handel, as well as The Four Seasons, Spring and Autumn by Antonio Vivaldi. "The Four Seasons" is the most well-known among the compositions from Vivaldi, an Italian Baroque composer and virtuoso violinist. Max Zheng played Ashitaka and San (Princess Mononoke) by Joe Hisaishi. This song was used in the 1997 Japanese anime film "Princess Mononoke", written and directed by Hayao Miyazaki of Studio Ghibli. San is also known as the "Wolf Girl" in the anime movie, having been raised by wolves after her parents abandoned her following an attack by the Wolf Goddess Moro. She acts, behaves and even resembles a wolf, however, things change when Prince Ashitaka finds her and displays his affection. She starts to recognise her human side and the two fall in love. Markov, who visited Meetup for the first time, gave his debut performance tonight. He played "My Funny Valentine" by Richard Rodgers. This song became a popular jazz standard. To date, it has been performed by more than 600 artistes and has appeared in more than 1,300 albums. Well done, Markov! We are happy that you stepped up and performed tonight! Hope to hear more pieces from you! 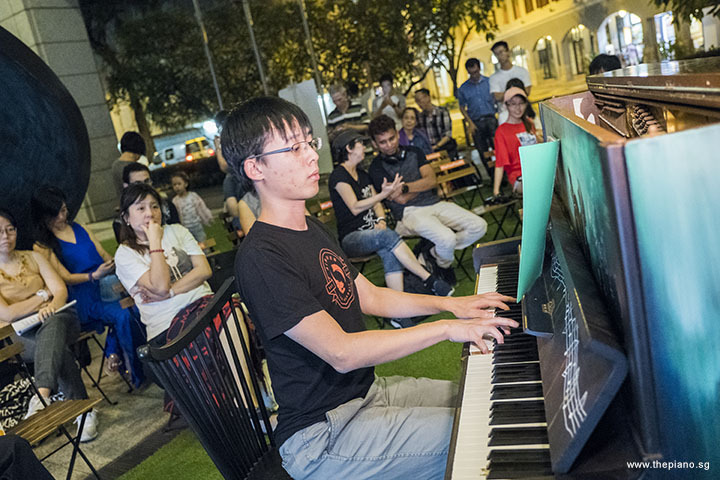 Chris Khoo played The Entertainer by Scott Joplin. Although Joplin is well-known for "The Entertainer", his other piece, "Maple Leaf Rag", composed in 1899, was more successful. In fact, it became the most famous of all ragtime pieces, and Joplin became known as “King of Ragtime”. This piece provided him a steady income for the rest of his life. Joplin went on to perform other famous rags, like "The Entertainer" (1902) but did not repeat the success of "Maple Leaf Rag". Hiro performed La Campanella by Liszt. "La Campanella" means “the little bell” and was the nickname given to the third of Franz Liszt's six Grandes études de Paganini ("Grand Paganini Études"), S. 141. The composition originates from a violin piece, Violin Concerto No. 2 in B minor, Op. 7, composed by Niccolò Paganini in Italy in 1826. Liszt brought this piece to the piano. The third movement is called "La Campanella" or "La Clochette”, owing to the little bell which Paganini uses to represent each occurrence of the rondo theme. Last but not least, Grace Wong played Sonata in D Major, K. 576, 1st Movt, Allegro by Mozart. Mozart once wrote that, “meanwhile I am working on six easy piano sonatas for Princess Friederike and six quartets for the King". Today, K. 576 is considered as one of Mozart's most difficult sonatas. Some contemporary pianists, like American pianist Charles Rosen, believe that Mozart may have considered these passages easy by his standard. The Mini-Recital came to an end and we entered the Open Segment. A Pianovers Meetup would not be complete without a group photograph! We promptly had one taken for posterity. The Pianovers started to socialise among themselves, and chat. It was such a fantastic night of sharing! 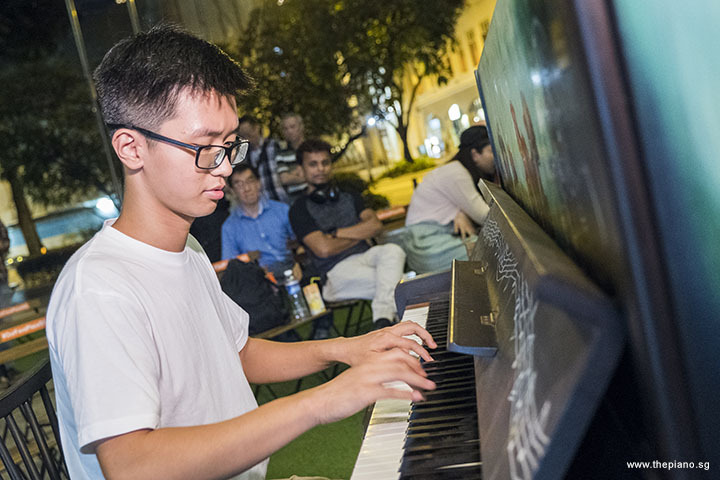 Some also took to the two pianos and jammed on them, amid encouragement by others around them. As Paul would be leaving Singapore the following day, Yong Meng and Chris had a group photograph taken with him! Thank you, Paul, for joining us tonight. We hope to see you soon at future Meetups! Soon, it was time to say goodbye. 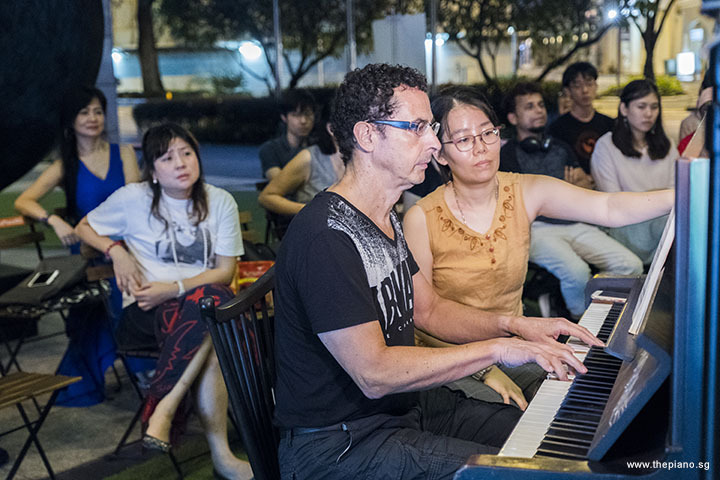 Thank you, Pianovers, for coming to Pianovers Meetup #78. See you all on Sunday for the next instalment!